Log cabin doors - which type would look good internally? The log cabin doors internally make a big impression on your overall interior feel! Not only do you look at doors but they are also are quite a tactile experience, as you touch and use them on a regular basis. It is important therefore that you get the right style for your log cabin and also the quality and performance match your expectations. Size also plays a role in you door selection, as different sizes are available. The handles although small, can make the difference on a door and you should spend some time choosing the best ones. 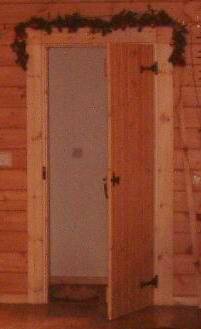 What do You need for Internal Log Cabin Doors? As the saying goes “size matters!” There are 2 main drivers behind the door size. Firstly you want to make sure the size you select is adequate for your requirements and secondly building codes and regulations need to be complied with, so you must meet minimum size requirements. The most important aspect of size is the door width. Most doors will come a standard height, but widths do vary. It may well depend on the room you are going into, a small office or den for example, may suit a narrower door than that opening into a large living area. It’s about balancing appearance, practicality and space. It can be difficult to visualize exactly what different sizes really look like, so my advice is going and see physical examples of all the doors sizes, before deciding what to use. Your architect should also be key in advising on the sizes of log cabin doors and what regulations need to be met. The style of log cabin doors can vary a lot and it depends on the overall look you are hoping to achieve, which doors will work best. Standard design styles will obviously be the cheapest, (as they are massed produced), but this may not achieve the bespoke or custom look you want. Taking it to the other extreme, some people even get their interior door hand carved, but this is costly! If you are not sure what style to choose, try doing image searches online to see examples of what others have done. 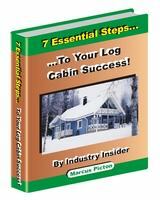 Hopefully your log cabin supplier will be a good help here, but don’t feel you have to choose their doors. As long as you understand the exact door sizes, (including the frames), then you can buy from anyone. A detailed floor plan of your design should contain this information and it is often wise to send this to any window or door supplier to ensure they know exactly what you need anyway. The majority of people choosing log cabin doors internally will try to select the same wood type for the doors as the logs are made from. This will complement your internal feel and the colour should be a good match too! However you do not have to use the same timber species and sometimes you may wish to use a higher quality wood for your internal doors, than the logs. In some instances a contrast can work quite well. Whilst the other option is to use a tinted wood varnish to colour match your logs. Always remember when trying to colour match different timber types, that the colour of your timber will mellow with exposure to light over the first few years and will ultimately become a bit darker. As previously mentioned a lot of inherent door quality comes from the timber species itself. With this in mind it pays to find out more about the timber used, where it was grown, typical age, moisture etc. Along side this, the overall thickness of the door is very important too. The thicker the door, the stronger and heavier it is and the more robust and resistant to any movement it will be. Always ask how thick the doors are. The construction of the door is critical too! Most log cabin doors are solid timber, but don’t just assume they are, find out! How the doors are finished can be a factor. Factory finished items should normally be better than those finished on site. Our quality section for window and doors will give you some more pointers on this subject too.